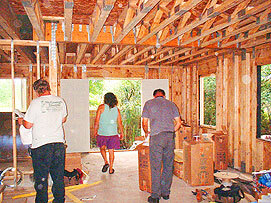 Once the house was dried in, we somehow thought that the pace of the project would slow down. How wrong could we get? Almost immediately we were inundated with guys installing utility facilities. Here electrician Travis is filling the living room with materials while Wayne checks the master plan for outlet placement. Elizabeth looks for space to store all the stuff. At the same time, Janucz is installing the ducting for the AC/heat system. 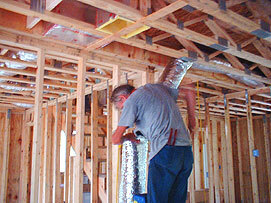 Here he’s cutting the flexible, metalized ducting to length to attach to the return register upstairs. Note the register opening above his head and ducting that is already installed. Also, the tiny blue squares to his right are Wayne’s light switch boxes. Soon there’s water and AC/heat pipes, ducts, wires and outlets spouting through the house like a mad scientist’s dream. The sense of chaos was only just balanced by the feeling of intense progress. Here’s Darby and his helper in the background installing water pipes in the kitchen while Wayne wires recessed light fittings and Travis installs outlets. Whoa! Not to be outdone, Janucz soon has giant octopi of ducting reaching all through the attic and floor joist areas. 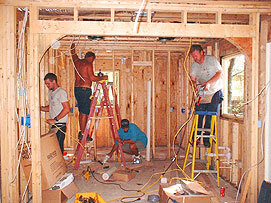 The internal structure of the house looked mighty spacious before the utility technicians showed up. Now there seems barely room to turn around. The interior AC/heat unit is to located in the second bedroom closet, shown here in the background. 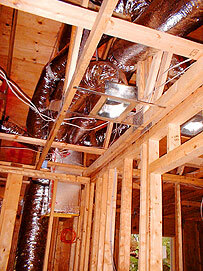 The register spanning two joists is a main bedroom outlet. 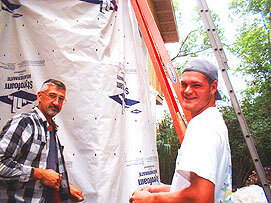 Meanwhile, our roofer Andy and his assistant Wes show up in their guise as siding installers and set to work covering the plywood sheathing with special, waterproof plastic wrap that also “breathes”. 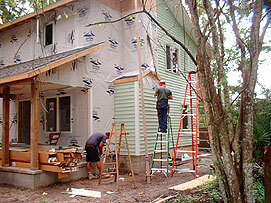 When the house is fully covered, we’ll be ready for the vinyl siding to go up. Happy not to be working in utility chaos inside, Andy and Wes take time to smile for us before nailing up the last section of wrap. Note the little dots on the material that act as nailing guides. 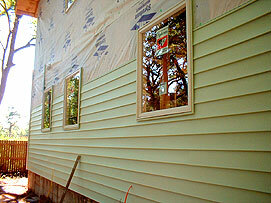 The roughed-in utilities are almost done but these two will be back tomorrow to hang siding. The next morning they started hanging the vinyl siding on the west aside of the house. 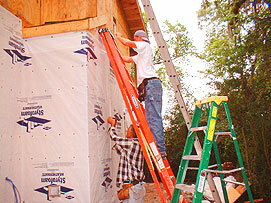 In this case, our siding is formed to look like lapped boards. Great color, eh? Andy and Wes is holding a piece of siding they have cut to fit the last section of the second row. He is preparing to snap the bottom of it in place over the “track” ready for it at the top of the first row. That “track” section is nailed through the wrap into the ply cladding. 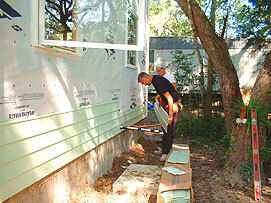 This type of siding installs fast and within an hour or so almost half the west wall is done – and looks great! Note that the siding abuts the windows with special “J track”, which is sectioned to resemble its name. The J track is nailed to the cladding alongside the window frame and the curve of the J holds the siding in place next to it. Before long, the west side is complete, the east side is coming on and its time to tackle the somewhat challenging chimney, with its angles and short sections. They’re doing well, though! Note the white angled pieces that allow the transition around corners and the white vinyl soffit that they also installed under the roof overhang at the top right. We’re getting there – fast!